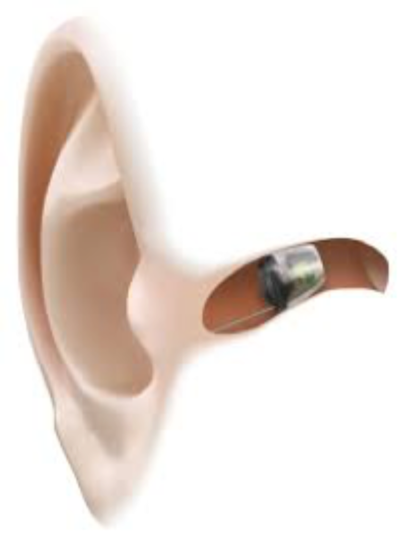 While many behind-the-ear and in-the-ear hearing aids are so small that they could be described as “practically” invisible, advances in circuitry miniaturisation in recent years has facilitated the rise of a new class of devices know as IIC hearing aids (invisible-in-the-canal). They are so small that they sit beyond the first bend of the ear canal and are therefore cannot be seen externally. In evaluating the best solutions from the world’s leading manufacturers who have hearing aids in this category, we looked for devices that were the most discreet without compromising on the technological features that provide a natural and clear hearing experience. We found that there were two hearing aids that clearly led the way, so here we are going to feature both – the Oticon Alta 2 ICC and the Starkey SoundLens Synergy. Oticon Alta 2 is the premium, most advanced level of hearing solution from Oticon, which comes in the IIC model. Whether in quiet or noisy environments or, Alta 2 allows you to participate conversations with minimal effort. Alta2 also gives us – your hearing care professionals – more opportunities to personalise and tailor the sound to your personal hearing preferences in order to provide you with a more natural listening experience. The IIC is also available in two lower technology levels (price points). ConnectLine is a series of devices that help you connect to a wide variety of communication and entertainment applications – transforming Alta 2 into a personal wireless headset through Streamer Pro. With Streamer Pro and the free ConnectLine App, you can also use your iPhone®, iPad®, iPod touch®, Android™ smartphone or tablet to control your Alta 2 hearing aids and ConnectLine devices discretely. Starkey were the first hearing aid company to release an invisible solution and they have continued to improve upon this technology. These tiny hearing aids are loaded with advanced features. While maintaining the power of Starkey Sound, our wireless solutions give you the ability to stream TV, music and much more. Available in a variety of skin-tone colours. The IIC is also available in a range of technology levels (price points). Wireless Connectivity: Receive a direct connection between your phone, or any other Bluetooth® device, and your hearing aids. Stream TV, music and more with accessories like SurfLink® Mobile 2, SurfLink Media 2 and SurfLink Remote. Made for Invisible Fit: SoundLens Synergy rests comfortably in the second bend of your ear canal where it’s virtually undetectable to others. Custom fit for comfort: They’re custom fit to your unique ear canal for all day comfort, and rest deep inside your ear where no one can see them. No buzzing or whistling: Best-in-class feedback cancellation system providing feedback-free, comfortable listening all-day long. Individualisd tinnitus relief: Advanced Multiflex Tinnitus Technology integrated into SoundLens Synergy to bring relief to those who suffer from ringing in the ears. SurfLink Media 2 plugs into your TV or Stereo to link your hearing aids. 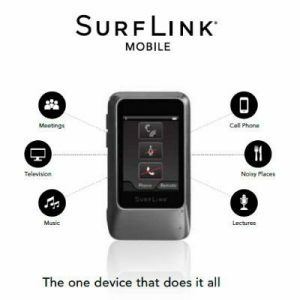 SurfLink remote can be used to adjust volume, change memory modes and more. SurfLink Remote Microphone is a discreet, lightweight microphone is worn by your conversation partner to aid you in one-on-one conversations in difficult listening environments.